Benjamin and Eleanor Steinman sold this lot to Enoch Dieterle for $500 on February 1, 1926. The next record of sale I found at the Washtenaw County Registrar of Deeds was a transfer on May 31, 1946, from Clifford D. Davis to Homer and Esther Kaercher. The Kaerchers had the house built (by Kurt Lange), and the City Directory shows them living there in 1949. The Kaerchers moved to S. Maple to be close to Mr. Kaercher's aunt and uncle, Ottmar and Melita Kaercher, who were living on Lot 1 (2509 W. Liberty). They lived at 744 S. Maple for about 30 years until they moved to Freedom Township. The Kaerchers were married on October 25, 1941, and had one son, Daniel W. Kaercher who is a Licensed Pharmacist in Traverse City, MI. Homer Kaercher was born in Ann Arbor on August 9, 1916. He worked at the First of America Bank in Ann Arbor for 39 years until he retired in 1976. He was also a veteran of World War II. Mr. Kaercher passed away on April 17, 1993. Esther worked at the Ann Arbor YMCA as a bookkeeper. Until recently, she volunteered every Tuesday in the office of the Zion Lutheran Church on West Liberty. Mrs. Kaercher has been very helpful to me in creating this site by providing information and photos. Here are some of the photos she provided. --Esther Kaercher and Spot. Is that S. Maple Road in the background? I looks a lot different today. --Esther Kaercher with Ruth Jedele (770 S. Maple) and their children in Esther's back yard. --Homer, Esther and Daniel Kaercher on Dan's graduation day. --Homer and Esther after they moved to Freedom Township. The Kaerchers sold their house to A. William Klinke II and his wife Bethany L. Klinke on August 21, 1981, for $33,000. 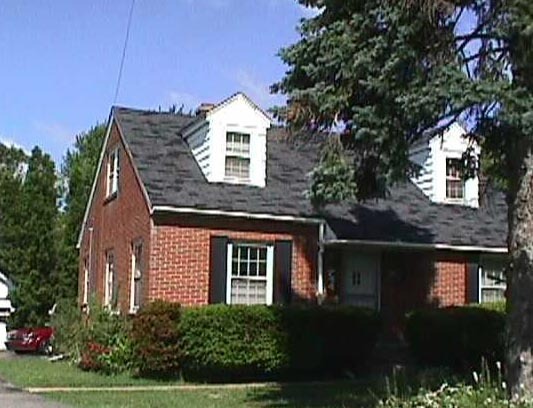 After five years, the Klinkes sold the house to Mark A. Burke on June 20, 1986, for $62,500. Mark A. and Brigitte A. Burke stayed for six years, selling the house to Christine L. Lutz for $112,500 on April 14,1992. Four years later, on May 28, 1996, Christine L. Lutz sold the house to Amy E. Rothberg for $121,000. Dr. Rothberg and her husband Marco Garcia were living at 744 S. Maple when I moved into 2509 W. Liberty. I could look out my kitchen window and see these amazing life-sized sculptures of people in their back yard. Click here to view some articles I found on the web about Mr. Garcia. Dr. Rothberg sold the house to it's current resident, Randy Jay Yarger, on September 8, 2000. Mr. Yarger is a computer professional and has written several books, including Managing and Using MySQL, By George Reese, Randy Jay Yarger, Tim King, and Hugh Williams. Randy moved out of 744 S. Maple last fall, and the house is now (1/29/09) on the market for $159,500. On March 18, 2009, the house was listed for $129,000.